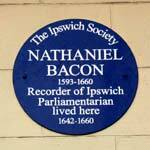 Going back to the mid 1600s, the town was represented in parliament by the Bacon brothers, Nathaniel (see blue plaque) and Francis. Then, in the 1680s, came Sir Nicholas Bacon. The present incumbent -- Blinky Ben MP, miniature person -- fully endorses our crusade: see photo. Just as the middle ages drew to a close, our town's most famous son, Thomas Wolsey, was born. His father, Robert, was in the meat trade, hence Shakespeare's reference to the Cardinal as "this butcher's cur". Henry VIII gave Wolsey free range to control his affairs. Although now called the "Ipswich Chord", the streaky railway line to the north of Hadleigh Road was previously named the "Bacon Curve". This was entirely due to its proximity to the old Harris bacon factory on that site. Older readers may also remember Bacon Curve as the infamous local prog rock group who were due to support Led Zep at the St Matthews Baths Halls in 1971. Other bodies lending their backing include the Big Local Trust, known as BLT, and the Essex Pig Company at Jimmy's Farm. An invitation to the grand lunch of Bacon Town has already gone out to an A-list star who was born in Ipswich in the early 1960s. Anyone who has seen his performances as Lord Voldemort in the Harry Potter films will vouch that Ralph Fiennes is the original Ipswich ham. Come back, Ralph, and bring home the bacon!